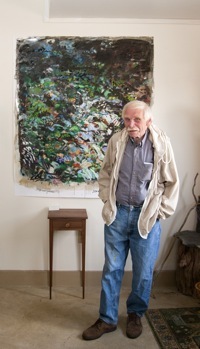 Arthur Cadieux with "In the Woods"
If you would like more information on on obtaining any of these paintings for exhibit or purchase please fill out the contact form, Click here. "There are 'local' artists, and there are 'regional' artists. Arthur Cadieux is not of these. He is an artist, a painter of quality, a man who can push paint to significant effect across canvases of small and large compass. Who else around has such color and such dark! He loves light and night, and the natural landscape, some people, cars and bicycles, and, bless him, naughty, raucous, omnipresent crows. Paint them, Arthur, among your brilliant trees! ".